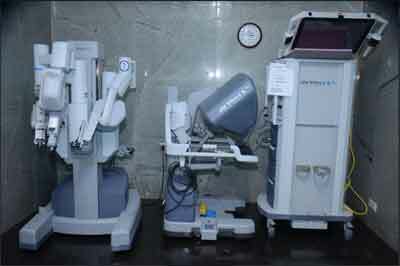 Hyderabad: The doctors at the Krishna Institute of Medical Sciences (KIMS Hospitals) have performed a unique robotic surgery to remove a tumour from Madhavi, a 27-year-old female’s pancreas. The 6×7 cms size Solid Pseudopapillary Epithelial Neoplasm (SPEN) tumour is believed to be the largest to date to be removed using robotic surgery procedure in India. This procedure was successfully accomplished by Dr Madhu Devarasetty, consultant surgical oncologist and Robotic surgeon and his team. The surgery performed on this young and newly married patient from Warangal, Telangana State, was accomplished with Si Davinci system and specimen extracted through a small 6 cms incision that leaves a very tiny and perishable scar on the body. Surgery lasted for 5hr 30 min. Patient got discharged on 7th day. This solid pseudopapillary tumour consists of solid sheets of cells that are focally dyscohesive. In these cases, the necrosis is usually present, and as the cell death occurs distant from blood vessels; it leads to the formation of pseudopapillae. Commenting on the surgery and its success, Dr Madhu Devarasetty, Surgical Oncologist and Robotic Surgeon, KIMS Hospitals said, “At KIMS Hospitals, we have to date successfully performed 13 Robotic Whipple’s for pancreatic cancers; by far the highest in twin-cities. And in this particular case, the size of the tumor was much larger than anticipated. Using the highly advanced Davinci Si version surgical system, our focus was on precision.”In coming days we want to shift these patients directly to room without ICU stay. Biopsy reports are better than that of open surgery. The exactitude surgery performed using most advanced technology, resulted in speedy recovery of the patient. The young patient, a working woman from Warangal, Telangana State, was discharged from the hospital on the seventh day of the surgery, and has started attending to her work too. Considered as the most technically demanding procedure, KIMS Hospitals is very happy that its doctors have mastered this procedure along with promising results. Congratulations Dr Madhu. Commendable job.